His confidence comes despite that fact August saw the highest number of American fatalities since the war began in 2001. In the past six weeks, the Taliban have downed a Chinook helicopter, attacked a couple of governor’s compounds, hit the British Council in Kabul, killed twelve police officers in Lashkar Gah and claim to have assassinated the Mayor of Kandahar. General Allen says the enemy has been forced to resort to high profile attacks because they’ve lost so much ground on the battlefield. In his first broadcast interview, General Allen told NATO TV he wanted to reassure Afghans that despite the talk of troops withdrawing, foreign commitment to Afghanistan will be around for years to come. 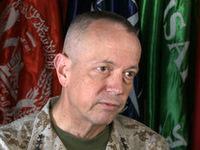 When General Allen took up command he laid down his four priorities for the ISAF campaign. “The second priority is to get the Afghan National security Forces as ready as we can. Get them at an institutional level, and operationally to partner with them to get them more firmly into the lead on the battlefield in an area … at the end of 2014."